The prospect of this delicious looking 5 reel candy online slot is one for all the gamers with a sweet tooth. Reminiscent of the ground-breaking Candy Crush saga, Lolly lands sumptuous Candyland graphics and gummy bear bonuses are destined to get your mouth watering when you play new online slots like this one. This pink and colourful online slot has been brought to you by the good folk at Chance Interactive. After entering the gaming market in 2014 they have went from strength to strength considering they are quite a new face within the market. You may be familiar with some of the games that this Australian firm has brought onto the market and we have many more at Wizard Slots online Casino. 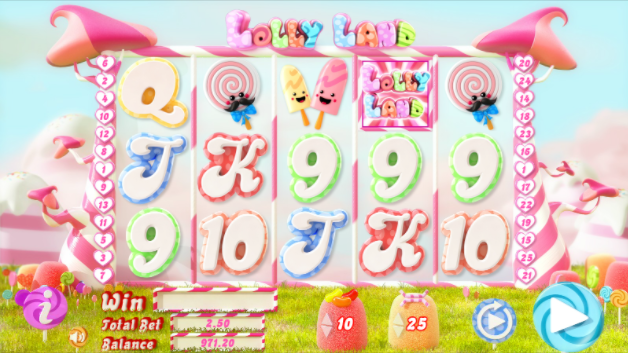 Lolly Land is an online slot game for anyone watching their weight, it enables you to satisfy your sweet tooth without gaining a pound. Spin your way through 5 reels and 25 paylines that spring to life when certain bets are placed on them. Bet for as little as 1 pence or separate yourself from the rest with some huge £50 bets if that’s the sort of thing that you’re into. So come and tag along to best new video slots in the market. In a similar fashion to many other games this game features playing card symbols which raises the question, is this another boring online slot game? No, it’s not, and I’ll tell you why. These playing cards have been spruced up to not only replicate playing cards but to harness the power of sugar and look good enough to eat. Anyway, the other symbols in this game are some of your most familiar candy pleasures. The highest payer in the game is the elusive Jelly Bean symbol. In respect of this, if you’re looking to gain some further information about Lolly Land’s bonus features then read below. Discover the small but brave green Jelly Bear and use him as a Wild Substitution to counteract any other symbol on the game apart from the Scatters. The scatter logo and the scatter lolly are the symbols you’ll be looking out for the most. Land 3 jelly bears and you will be awarded a sumptuous 3 free respins. Throughout these respins, the 2nd, 3rd, and 4th reels will grow and the Wild will immerse itself across your screen. Give the ‘Taste Me’ feature a lick by matching up three scattered lolly symbols and select the most prevalent lolly to earn yourself a little prize. If you’ve played your cards right then you could stumble across the multiplier which will see your winning soar, 100 fold. In addition, match 3 scatters and unlock the free spins feature. The more logos, the more free spins. A maximum number of 15 free spins will be rewarded but please be aware that your bet winnings will be doubled throughout this period. 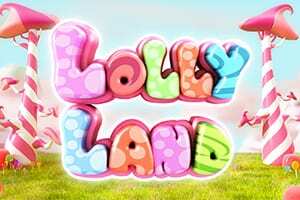 Lolly Land is a great looking game and owes itself to some detailed work carried out by the developers. The symbols and game board are highly responsive and this feature combined with the free spin and bonus features really separate this candy surprise from the rest of the online slot games. Wizard Slots grades Lolly Land an 8/10.